Quote Message: There is a big gap in where they stand within the leagues but Auchinleck Talbot are a fantastic junior side, a huge history within the game. So they’ll be here to show they’re good enough to compete with Ayr United. There is a big gap in where they stand within the leagues but Auchinleck Talbot are a fantastic junior side, a huge history within the game. So they’ll be here to show they’re good enough to compete with Ayr United. After a minute’s silence in memory of Willie ‘magic fingers’ Wallace, a trainer and phsyio for both sides, we are up and running. Talbot’s manager, Tommy Sloan is something of a local legend, having been in charge since 2003 and guiding the club to their past six Junior Cup successes as well as five league titles. The 54-year-old played for Ayr United in the 1980s as a striker, while he won the Challenge Cup and a League Two title with Stranraer. “The players have been looking forward to this game for weeks,” he tells BBC Scotland. “Now that it’s here, I hope they can put in a good performance. Auchinleck Talbot are the most successful junior club in the country, having won the Scottish Junior Cup on 12 occasions. This is the seventh season Talbot have competed in the Scottish Cup since it was revamped to include Scottish Junior Cup winners and the junior league champions. Their most notable appearance came in 2012 when they lost to Hearts at Tynecastle by a solitary goal. A bad offside call denied them a late equaliser that day. They have never taken an SPFL scalp, having lost out to Stirling Albion in 2010 and Stranraer in 2013 – after a replay. Beechwood has a reduced capacity of 3,100 for this sold-out encounter, with 1,700 tickets going to home supporters. The population of Auchinleck is just 3500. Quote Message: Beechwood is bursting at the seams. A typically tight ground and already the atmosphere is terrific. Both sets of fans in full voice. This should be a cracker of a cup tie. Beechwood is bursting at the seams. A typically tight ground and already the atmosphere is terrific. Both sets of fans in full voice. This should be a cracker of a cup tie. 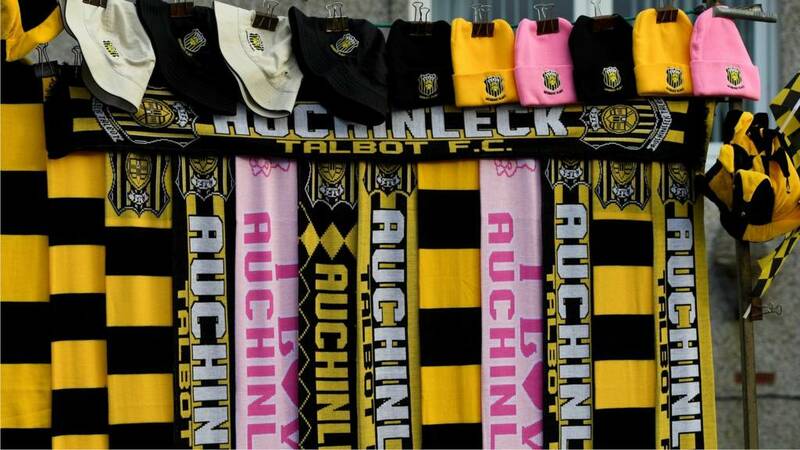 Auchinleck Talbot: Leishman, Lyle, McPherson, McCracken, Pope, White, Wilson, Armstrong, Hyslop, Glasgow, Wilson. Substitutes: Samson, Kemp, McIlroy, Shankland, Waite, Hewitt. Ayr United: Doohan, Geggan, Rose, Higgins, Harvie, McDaid, Murdoch, Docherty, Crawford, Moffat, Moore. Substitutes: Hare-Reid, Smith, Hilton, McGuffie, Ferguson, Bell, McCowan. Ayr United are only three points behind Championship leaders Ross County but Ian McCall’s side have been wobbling a bit of late and are without a win in five games, losing their last two league outings. Top scorer Lawrence Shankland missed those two defeats with a calf injury and the prolific striker is once again missing today. Biffy Clyro frontman Simon Neil welcomes the Scottish Cup to Ayrshire. Today’s action starts with an Ayrshire derby, with Championship promotion contenders Ayr United visiting Auchinleck Talbot. The hosts play in the junior ranks but they are no strangers to the Scottish Cup and the club is steeped in silverware success at their own level. The TV cameras are at Beechwood Park, with Sportscene starting on BBC One Scotland at noon. The winter break is over and, as luck would have it, the first scheduled match for a Premiership side was postponed due to the plummeting temperatures. Rangers’ Friday night visit to Cowdenbeath was called off, with a section of the Central Park pitch frozen, much to the annoyance of the League Two club, who had enlisted the help of fans to lay down covers. “If it was Berwick Rangers, the game would have gone ahead in my opinion,” said disappointed manager Gary Bollan. There’s no suggestion of any call-offs today. Who will get their hands on the oldest trophy in world football this season? The Scottish Cup has reached round four and that means all of the big boys are getting involved this weekend. Holders Celtic are going for three in a row for the first time in their history but will Brendan Rodgers’ side reach the final on 25 May? Here’s a refresher on the ties we have in store (all kick-offs 15:00 unless stated). Jose Mourinho: Would sacking Man Utd manager be justified?